Europe’s ongoing economic crisis has engendered a crisis of confidence in the European project. Europeans have declining faith in European economic integration as a means of strengthening their national economy. Many no longer look favorably on the European Union as an institution. And most Europeans do not favor ceding more decision-making power to the European Union in order to better deal with Europe’s economic problems. Public faith in the European project is now weakest in Greece, among the eight European Union countries surveyed. And it remains strongest in Germany. But since 2009 the decline in support for a united Europe has been greatest in France and Spain. In 1957, six European nations signed the Treaty of Rome, establishing the European Economic Community. The widely shared rationale behind this European project was that removing barriers to trade and investment among these economies would spur economic growth. Over a half century, the appeal of this prospect became ever more compelling. These six founding partners grew to a European Union of 27, soon to be 28 with the addition of Croatia. But the euro crisis has shaken Europeans’ assumption that a deeper and broader European Union is in their self-interest. 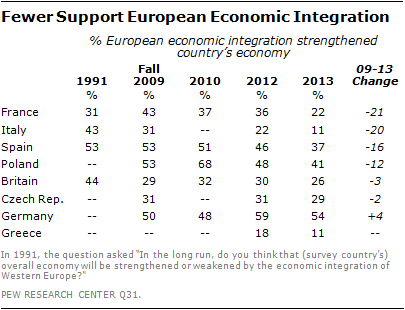 A median of only 28% think European economic integration has strengthened their economy. This includes just 11% of the Greeks and Italians and only 22% of the French, the latter two citizens of founding members of the European Community. Such sentiments are not a one-year phenomenon. Since the fall of 2009, support for a more integrated European economy has dropped sharply: by 21 points in France, 20 points in Italy, 16 points in Spain. In Poland, where enthusiasm for integration peaked at 68% in 2010, that support has fallen by 27 points. In most countries, people with a college education are more likely than those without a university degree to still believe in economic integration. People’s confidence in the European Union as an institution is waning even faster. A median of only 45% now think favorably of the Brussels-based organization. That support is down 34 percentage points in Spain since 2007, before the euro crisis began. It has declined 21 points in France and 20 points in Italy. Even in Germany, where three-in-five people are still favorably inclined toward the EU, support of the institution is down 8 points. Given the EU’s declining stature within Europe, it is not surprising that few Europeans want to give more decision-making authority to the European Union to deal with Europe’s economic problems. Only in Germany (51%) and Italy (49%) does such centralization enjoy even modest support. Fully 71% of the British oppose giving Brussels more power. The euro-skepticism of British conservatives plays a big role in such sentiment: 82% of people on the right of the political spectrum in Britain are against any such centralization of authority within Europe. In addition, 63% of the Greeks oppose moving more decision making to the EU, as do more than half (53%) of the French. One means of assessing continued fealty to the ambition of a united Europe in the face of the euro crisis is public willingness to help other European Union members in distress. Repeated bailouts – of Ireland, Portugal, Greece and Cyprus – have sorely tested such European solidarity. Support for assistance to other EU countries that have major financial problems has actually grown in Germany, where a majority (56%) opposed such bailouts in 2010 and now roughly half (52%) back them. But the crisis has had the opposite effect on French public opinion: 53% supported helping others in 2010, and now a strong French majority (60%) is against such efforts. The British have always looked askance at action to help others in financial distress. Meanwhile, in Greece, which has been the beneficiary of a bailout, and Italy and Spain, which might one day benefit from extensive aid, overwhelming majorities think such assistance is good and proper. Complicating matters for the future of the European Union, young adults ages 18 to 29, the next generation of EU citizens, have also lost some of their faith in the European Project, with the declines on par with the souring of the mood among the EU’s founding generation of those age 50 and older. In Spain, among the young, favorability of the EU is down 42 points since 2007 and support for economic integration is down 25 points since 2009, possibly reflecting the heavy toll unemployment has taken among Spain’s youth. In France, backing for the EU is down 28 points and belief in the benefits of integration has fallen 22 points. There have been double digit declines among the young in support for these two pillars of European identity in the Czech Republic, Italy, Britain and Poland. The European Union has long held itself out as an alternative economic and political model for the world: a successful experiment in economic integration, intergovernmental decision making and peaceful resolution of long-standing territorial disputes. These soft power attributes have been tested by the euro crisis and, for the most part, the EU’s reputation remains strong. A median of 54% of 29 countries not members of the European Union have a favorable view of the EU. (This compares with a median of 45% within the EU.) Fully 63% of Russians, 61% of Japanese, 54% of Brazilians, 50% of Americans and 37% of Chinese see the EU in a positive light. Among those 21 nations for which there is comparable data, a median of 53% had a positive impression of the EU in 2007 and 50% have a favorable view today. Another test of the impact of the euro crisis is whether continued participation in various aspects of the European project – use of the euro as a currency, continued membership in the European Union – remains attractive to Europe’s people. Here the story is mixed. 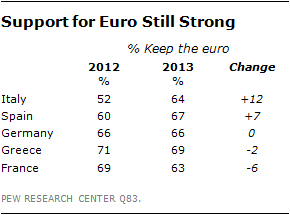 Support for the euro is strong. Solid majorities in Greece (69%), Spain (67%), Germany (66%), Italy (64%) and France (63%) want to keep using the currency and not return to their previous national scrip. These percentages are largely unchanged over the past two to three years, and backing for the euro has actually gone up in Italy and Spain since 2012. Clearly, the euro crisis is not yet a crisis of the euro. Nonetheless, among those who think European economic integration has not been good for their country, nearly half of those Germans (49%) want to revive the mark, and a substantial minority of those French (45%) and Spanish (43%) want to revive the franc and the peseta, respectively. And 41% of Germans ages 18 to 29 want to return to the mark, compared with only 26% of people ages 50 and older. Moreover, the proportion of young people who want to return to the mark has grown from 21% in 2010. In every country, those without a college education are far more likely than those with a university degree to want to return to their national currency. Despite growing public dissatisfaction with the European Union, only the United Kingdom is openly considering leaving the institution. The British people are divided on the issue. Prime Minister David Cameron has promised to conduct a national referendum on continued British membership in the EU no later than the end of 2017. At this early date, 46% of the public want to remain in the EU and 46% want to depart. Support for continued membership is strongest among those on the left (68%), those ages 18 to 29 (59%) and those with a college education (55%).